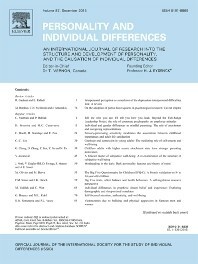 The official journal of ISSID is Personality and Individual Differences, published by Elsevier. The Editor-in-Chief is Don Saklofske. The associate editors and editorial board reflect the broad interests of the society. Personality and Individual Differences is devoted to the publication of articles (experimental, theoretical, review) which aim to integrate as far as possible the major factors of personality with empirical paradigms from experimental, physiological, animal, clinical, educational, criminological or industrial psychology or to seek an explanation for the causes and major determinants of individual differences in concepts derived from these disciplines. The editors are concerned with both genetic and environmental causes, and they are particularly interested in possible interaction effects. Ultimately they believe that human beings are bio-social organisms and that work on individual differences can be most fruitfully pursued by paying attention to both these aspects of our nature. They believe that advances are more likely to be made by the use of the hypothetical-deductive method, though empirical data based on sound research and providing interesting new findings, would of course not be rejected simply because they might not have a good theoretical underpinning. All in all, the traditional type of work on traits, abilities, attitudes, types and other latent structures underlying consistencies in behavior has in recent years been receiving rather short shrift in traditional journals of personality; Personality and Individual Differences aims to reinstate it to its proper place in psychology, equal in importance with general experimental work, and interacting with it to make up a unitary science of psychology. Instructions for authors are available online and should be followed.